Effective home defensive ammunition involves a delicate balance between bullet penetration and expansion. If the bullet goes through the attacker or misses its intended target and strikes an interior or exterior wall, the bullet expansion should greatly reduce the changes of effective over penetration through an interior or exterior wall into an adjacent room or through and exterior wall and into an adjacent house. Bullet expansion creates two effects; it makes a larger frontal contact surface which reduces continued penetration depth, and it reduces bullet velocity. The best home defense ammunition should maximize these effects. Effective personal defensive ammunition involves another delicate balance between penetration and expansion. The bullet must penetrate deep enough to damage major internal organs without penetrating through an attacker and penetrate the thickness of a human skull for 100% stoppage of a threat. The bullet must also expand enough to increase internal damage, but it cannot expand so much as to prevent penetration into major internal organs or through a human skull or over penetrate and go through the attacker’s body or skull. Up to now, our personal testing has proven the “Flex-Tip” bullet design provides an effective balance between penetration and expansion. These results indicate the bullet should penetrate deep enough to damage major internal organs without penetrating through an attacker as well as penetrate the human skull, and at the same time, it provides ensured expansion when fired through leather or heavy clothing. Its ensured expansion makes a larger frontal contact surface which reduces continued penetration depth, and it reduces bullet velocity. These effects should reduce over penetration through walls. However, a new bullet design has come to our attention. 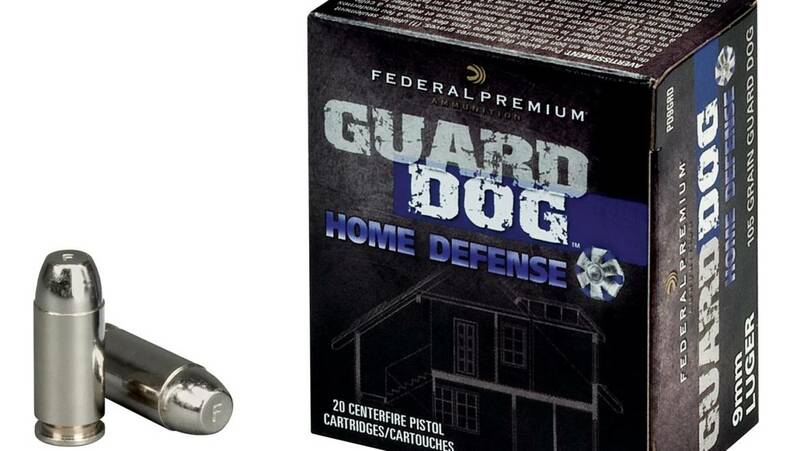 It is the “Guard Dog” cartridge make by “Federal” ammunition manufacturer. The design and properties of the “Guard Dog” cartridge could be more effective, when it comes to lethal body and skull penetration and at the same time reduced interior/exterior wall over penetration. CARTRIDGE CONSTRUCTION: According to an article titled: Federal Guard Dog, Few things are as comforting as a dependable guard dog by Richard Mann (Rss), March 16, 2012. 2. “Does the “Guard Dog” cartridge outperform the “Flex Tip” cartridge, when it comes to penetration deep enough to damage major internal organs without penetrating through an attacker and penetrate the thickness of a human skull for 100% stoppage of a threat? Shooting a 9mm (105 grain) cartridge out of a tactical 9mm AR with a 16” barrel. This will be a side by side bullet expansion and penetration test using standard “Full Metal Jacket” (“FMJ”) (115 grain), “Critical Duty”, “Flex Tip” Jacketed Hollow-point” (“JHP”) (135 grain), “Critical Defense”, “Flex Tip” Jacketed Hollow-point” (“JHP”), and “Guard Dog”, (“EFMJ” or “CSP”) (105 grain). This test will fire these four (4) bullet designs through a simulated residential building exterior wall made of standard thickness drywall, 1/4″ thick standard particle board, standard vinyl siding and into four (4) Springfield, MO area telephone books. 1. Yes, the “Guard Dog” cartridge outperforms the “Flex Tip” cartridge, when it comes to bullet expansion and reduced penetration through interior/exterior walls. The bullet design appears to have caused the bullet to begin expanding when it struck the drywall material of the simulated residential wall. 2. 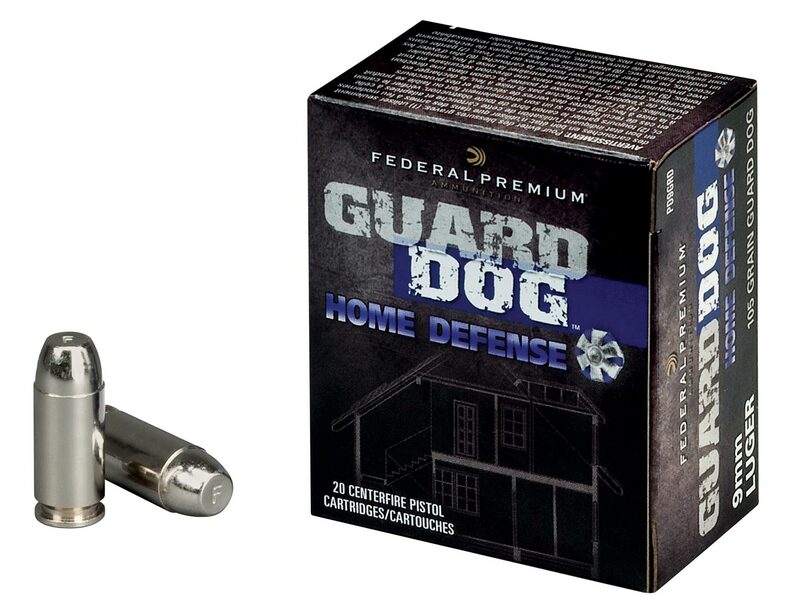 Yes, the “Guard Dog” cartridge appears to outperform the “Flex Tip” cartridge, when it comes to penetration deep enough to damage major internal organs without penetrating through an attacker and penetrate the thickness of a human skull for 100% stoppage of a threat. No bullet design or makeup can eliminate body/skull or interior/exterior wall over penetration; however, bullet design and makeup can go a long way towards reducing these over penetration concerns. The best home and personal defense cartridge should incorporate the best currently available bullet design and makeup specifically focused on lethal body and skull penetration and at the same time reduced interior/exterior wall over penetration.